The Modern Workplace: Federal Labor Law May Be an Important Factor in Your Decision To Terminate an Employee for Racist Conduct. With the violent protest events in Charlottesville, Virginia last weekend, it seems particularly timely to address a recent Eighth Circuit Court of Appeals decision on potential labor law protections for racist behavior. While Judge Beam of the Eighth Circuit opined that “no employer in America can be forced to employ a racial bigot,” he did not persuade the rest of the Court’s panel in the recent Cooper Tire v. NLRB decision. In the Cooper Tire case, the Eighth Circuit Court of Appeals examined tensions between behavioral protections for picketing workers under the federal National Labor Relations Act and an employer’s Title VII obligation to provide a workplace free from behavioral harassment based on race. Cooper Tire involved the lock out of union employees after failed collective bargaining negotiations. During the lock-out, a picketing employee yelled racial slurs at a van carrying replacement workers of color to the workplace. Cooper Tire fired that employee. Were those racial slurs protected? The Eighth Circuit ruled “yes.” It held that Section 7 of the National Labor Relations Act protects employees’ right to “engage in other concerted activities for the purpose of collective bargaining.” The Court noted that a number of federal courts have interpreted Section 7 to protect marginal (if not outright inappropriate) conduct from employees on picket-lines. 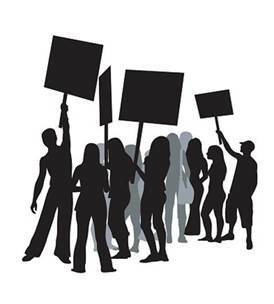 The Circuit Court of Appeals for the District of Columbia, for example, has held that “[i]mpulsive behavior on the picket line is to be expected . . . ,” and the Second Circuit has written that a “necessary condition of picketing is a confrontation in some form . . . .” Relying on its own precedent, the Eighth Circuit held that firing the employee for his racial slurs violated the NLRA largely because the conduct was not directed to a particular person and did not continue over a long period of time. In Cooper Tire, the Court distinguished an earlier Eighth Circuit picket-line case where the picketing employee held up a lewd and highly offensive sign about another employee who was crossing the picket-line. Because in that situation the conduct was directed at a particular, identifiable employee and the sign was held up for several minutes during the protest, the Court held that the conduct justified termination despite Section 7. Is this factual difference really a sufficient distinction warranting a different result? Unlike the Cooper Tire case, the events in Charlottesville last weekend obviously did not involve picketing employees or a protest of a particular employer’s practices. The Cooper Tire case is a good illustration, however, of the fact that employer obligations are complicated and consulting with counsel in deciding whether to fire an employee for racist behavior is wise.